* 6 Cylinder engine * * Check out this 2018 RAM 3500 Lone Star * * 2018 ** RAM * * 3500 * This Brilliant Black Crystal Pearlcoat 2018 RAM 3500 Lone Star might be just the crew cab 4x4 for you. It has a 6 Cylinder engine. Enjoy superior fuel economy with a diesel engine. The exterior is a classic brilliant black crystal pearlcoat. Call today to schedule your test drive! Contact Information: Bayway Chrysler Dodge Jeep Ram, 4000 Pasadena Highway, Pasadena, TX, 77503, Phone: (713) 433-4000, E-mail: internetleads1660@car-crm.com. * 6 Cylinder engine * * Check out this 2018 RAM 3500 SLT * * 2018 ** RAM * * 3500 * This Bright White Clearcoat 2018 RAM 3500 SLT might be just the crew cab 4x4 for you. It has a 6 Cylinder engine. Save time and money at the pump with this diesel-fueled vehicle. The exterior is a charming bright white clearcoat. This is the vehicle you have been waiting for! Call now to schedule a test drive! Contact Information: Bayway Chrysler Dodge Jeep Ram, 4000 Pasadena Highway, Pasadena, TX, 77503, Phone: (713) 433-4000, E-mail: internetleads1660@car-crm.com. 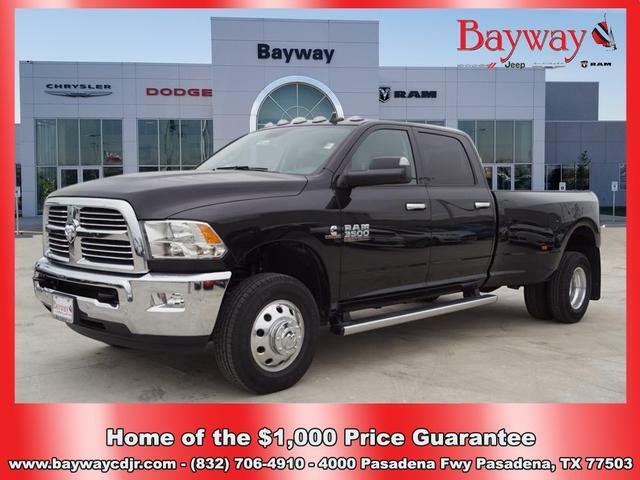 * 6 Cylinder engine * * Check out this 2018 RAM 3500 Laramie * * 2018 ** RAM * * 3500 * This Brilliant Black Crystal Pearlcoat 2018 RAM 3500 Laramie might be just the crew cab 4x4 for you. It comes with a 6 Cylinder engine. Enjoy superior fuel economy with a diesel engine. The exterior is a dazzling brilliant black crystal pearlcoat. Call today to test it out! Contact Information: Bayway Chrysler Dodge Jeep Ram, 4000 Pasadena Highway, Pasadena, TX, 77503, Phone: (713) 433-4000, E-mail: internetleads1660@car-crm.com. * 6 Cylinder engine * * Check out this 2018 RAM 3500 Laramie * * 2018 ** RAM * * 3500 * This Delmonico Red Pearlcoat 2018 RAM 3500 Laramie might be just the crew cab 4x4 for you. It has a 6 Cylinder engine. Check out the driving performance on this diesel-engine vehicle. The exterior is a dazzling delmonico red pearlcoat. Interested? Call today and take it for a spin! Contact Information: Bayway Chrysler Dodge Jeep Ram, 4000 Pasadena Highway, Pasadena, TX, 77503, Phone: (713) 433-4000, E-mail: internetleads1660@car-crm.com. 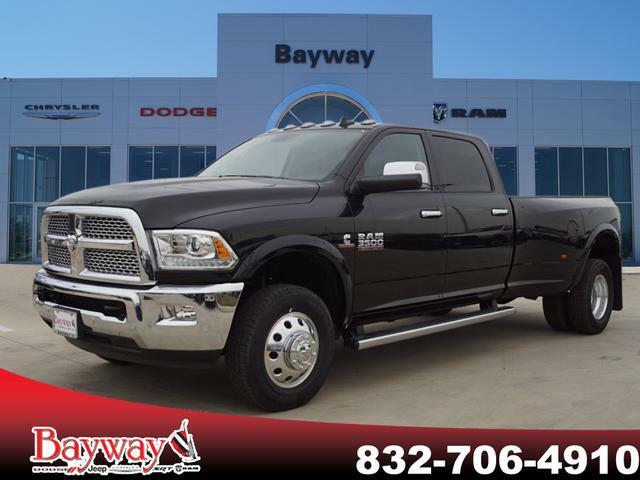 * 6 Cylinder engine * * Check out this 2018 RAM 3500 Laramie * * 2018 ** RAM * * 3500 * This Black 2018 RAM 3500 Laramie might be just the crew cab 4x4 for you. It comes with a 6 Cylinder engine. It runs on diesel. The exterior is a suave black. Good cars sell fast! Give us a call and schedule an appointment today! Contact Information: Bayway Chrysler Dodge Jeep Ram, 4000 Pasadena Highway, Pasadena, TX, 77503, Phone: (713) 433-4000, E-mail: internetleads1660@car-crm.com. * 6 Cylinder engine * * Check out this 2018 RAM 3500 Laramie Longhorn * * 2018 ** RAM * * 3500 * This Bright White Clearcoat 2018 RAM 3500 Laramie Longhorn might be just the crew cab 4x4 for you. It comes with a 6 Cylinder engine. Enjoy superior fuel economy with a diesel engine. The exterior is a classic bright white clearcoat. View this beauty and our entire inventory today! Call for more details. Contact Information: Bayway Chrysler Dodge Jeep Ram, 4000 Pasadena Highway, Pasadena, TX, 77503, Phone: (713) 433-4000, E-mail: internetleads1660@car-crm.com. * 6 Cylinder engine * * Check out this 2018 RAM 3500 Laramie Longhorn * * 2018 ** RAM * * 3500 * This Pearl White 2018 RAM 3500 Laramie Longhorn might be just the crew cab 4x4 for you. It comes with a 6 Cylinder engine. Get lower maintenance and lower emissions with this diesel vehicle. The exterior is a gorgeous pearl white. Interested? Call today and take it for a spin! Contact Information: Bayway Chrysler Dodge Jeep Ram, 4000 Pasadena Highway, Pasadena, TX, 77503, Phone: (713) 433-4000, E-mail: internetleads1660@car-crm.com. * 6 Cylinder engine * * Check out this 2018 RAM 3500 Laramie Longhorn * * 2018 ** RAM * * 3500 * This Brilliant Black Crystal Pearlcoat 2018 RAM 3500 Laramie Longhorn might be just the crew cab 4x4 for you. It has a 6 Cylinder engine. Enjoy superior fuel economy with a diesel engine. The exterior is a ravishing brilliant black crystal pearlcoat. Call today and take this one out for a spin! Contact Information: Bayway Chrysler Dodge Jeep Ram, 4000 Pasadena Highway, Pasadena, TX, 77503, Phone: (713) 433-4000, E-mail: internetleads1660@car-crm.com. 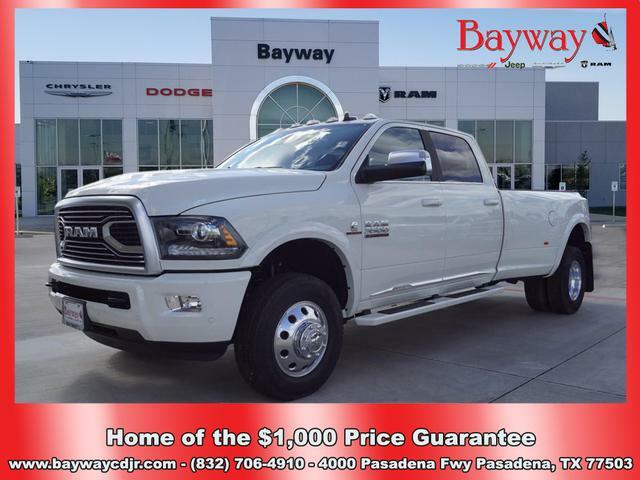 * 6 Cylinder engine * * Check out this 2018 RAM 3500 Limited * * 2018 ** RAM * * 3500 * This Pearl White 2018 RAM 3500 Limited might be just the crew cab 4x4 for you. It comes with a 6 Cylinder engine. It runs on diesel. The exterior is a timeless pearl white. Come see us today and see this one in person! Contact Information: Bayway Chrysler Dodge Jeep Ram, 4000 Pasadena Highway, Pasadena, TX, 77503, Phone: (713) 433-4000, E-mail: internetleads1660@car-crm.com. * 6 Cylinder engine * * Check out this 2018 RAM 3500 Laramie Longhorn * * 2018 ** RAM * * 3500 * This Brilliant Black Crystal Pearlcoat 2018 RAM 3500 Laramie Longhorn might be just the crew cab 4x4 for you. It comes with a 6 Cylinder engine. Fuel up with diesel and fill up less. The exterior is a sharp brilliant black crystal pearlcoat. Don't wait until it is too late! Call today to schedule an appointment. Contact Information: Bayway Chrysler Dodge Jeep Ram, 4000 Pasadena Highway, Pasadena, TX, 77503, Phone: (713) 433-4000, E-mail: internetleads1660@car-crm.com. 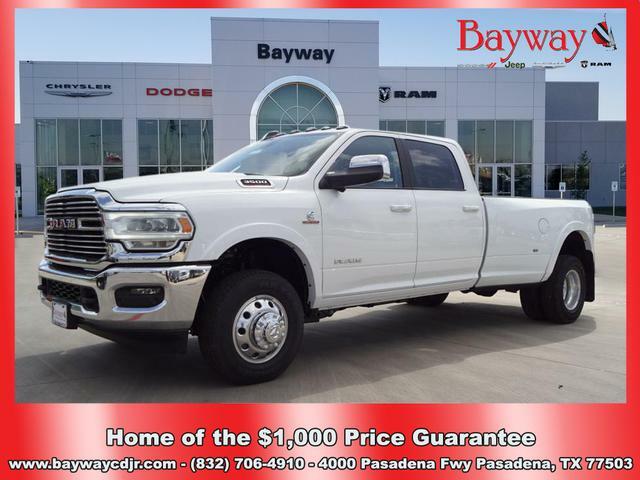 * 6 Cylinder engine * * Check out this 2019 RAM 3500 Laramie * * 2019 ** RAM * * 3500 * This Bright White Clearcoat 2019 RAM 3500 Laramie might be just the crew cab 4x4 for you. It has a 6 Cylinder engine. It runs on diesel. The exterior is a stunning bright white clearcoat. This is the vehicle you have been waiting for! Call now to schedule a test drive! Contact Information: Bayway Chrysler Dodge Jeep Ram, 4000 Pasadena Highway, Pasadena, TX, 77503, Phone: (713) 433-4000, E-mail: internetleads1660@car-crm.com. 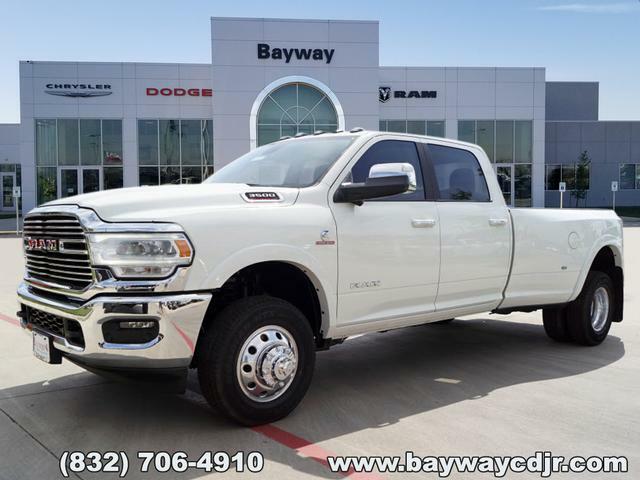 * 6 Cylinder engine * * Check out this 2019 RAM 3500 Laramie * * 2019 ** RAM * * 3500 * This Pearl White 2019 RAM 3500 Laramie might be just the crew cab 4x4 for you. It comes with a 6 Cylinder engine. It runs on diesel. The exterior is a ravishing pearl white. Good cars sell fast! Give us a call and schedule an appointment today! Contact Information: Bayway Chrysler Dodge Jeep Ram, 4000 Pasadena Highway, Pasadena, TX, 77503, Phone: (713) 433-4000, E-mail: internetleads1660@car-crm.com.